Omer Asık gets the pass from Darius Miller and quickly switches hands for the lay-in. Anthony Davis scores 21 points as the Pelicans defeat the Magic 118-98. Tyreke Evans and Terrence Jones combine for 53 points and 16 boards as the Pelicans defeat the Nets, 104-95. Isaiah Thomas goes off for 38 points with three boards as the Celtics top the Pelicans, 117-108. Anthony Davis scores 20 points as the Pelicans beat the Clippers. Russell Westbrook scores 42 points with 10 rebounds to lead the Thunder over the Pelicans, 121-110. Anthony Davis get 31 points as the Pelicans defeat the Sixers, 108-93. Chris Paul drops 20 points and 20 assists as the LA Clippers defeat the New Orleans Pelicans 133-105. Ersan Ilyasova hits 23 points as the Sixers defeat the Pelicans. Omer Asik cuts down the lane for the slam dunk. Tim Frazier scores 21 points and hands out 14 assists as the Pelicans blow out the Hawks, 112-94. Anthony Davis scores 38 points with 15 rebounds to lead the Pelicans over the Hornets in overtime, 121-116. Anthony Davis has 38 points as the Pelicans defeat the Blazers, 113-110. Stephen Curry sets an NBA record with 13 3-pointers finishing with 46 points to lead the Warriors over the Pelicans. Giannis Antetokounmpo scores 24 points with 10 boards and seven assists, Jabari Parker adds 21 as the Bucks take it, 117-113. Kawhi Leonard scores 20 points to lead the Spurs over the Pelicans 98-79. Jusuf Nurkic scores 23 points and grabs nine rebounds to lead the Nuggets past the Pelicans, 107-102. Anthony Davis stuffs the stat sheet with a 50-point, 16 rebound, seven steal and four block performance in the loss. Evan Fournier led the Magic in scoring tonight with 24 points, but it was Elfrid Payton shot that sent the game into OT. James Harden had 14 points and 8 assists in 24 minutes as the Rockets defeat the Pelicans in China. Karl-Anthony Towns scores 28 points and grabs 14 rebounds to lead the Timberwolves past the Pelicans, 144-109. Drafted 36th overall by Portland in the second round of the 2008 NBA Draft …Draft rights were traded to Chicago in exchange for Denver’s 2009 second-round pick, New York’s 2009 second-round selection and Chicago’s 2010 second-round pick 9/10/10…Signed as a restricted free agent by the Rockets 7/24/12, after Chicago chose not to match Houston’s offer sheet…Acquired from Houston in three-team trade by New Orleans along with Omri Casspi in exchange for a future first-round pick 7/15/14…Re-signed to multi-year contract by New Orleans 7/9/15. In 68 games with the New Orleans Pelicans (64 starts), averaged 4.0 points and 6.1 rebounds per game in 17.3 minutes…Notched 12 games of double-digit rebounds…Notched his second double-double of the season, grabbing 11 boards and scoring a career high 24 points on 10-13 from the floor in a season-high 32 minutes 4/13 at MIN…Set a new season high with 15 boards in 24 minutes 3/24 at IND…Recorded his first double-double of the season, setting a season high with 15 points and grabbing 14 boards 3/20 vs. LAC…Exited after 7:11 due to a right ankle sprain 2/21 at DET…Grabbed 14 rebounds 2/19 vs. PHI…Grabbed 13 boards to go along with eight points 1/28 vs. SAC… Scored 12 points and grabbed eight rebounds 1/21 vs. DET…Grabbed a then-season-high 13 boards on back-to-back nights: 1/12 at LAL and 1/13 at SAC…Played 16 minutes, scoring two points and grabbing five rebounds 11/10 vs. DAL…Sidelined for five out of the first six contests with a calf strain. 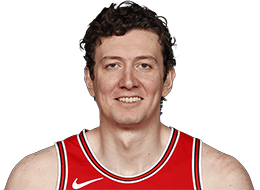 Appeared in all 82 games with the Bulls, posting averages of 2.8 points, 3.7 boards, 0.68 blocks and 12.1 minutes per game…Posted four games of double-digit rebounding, three games with 10- plus points and recorded one double-double…Ranked fifth in the NBA in offensive rebounds per 48 minutes (5.4), 11th in blocks per 48 minutes (2.72), 12th in rebounds per 48 minutes and 20th in defensive rebounds per 48 minutes (9.4)…Posted 13 points (5-6 FG), seven boards and a season-high five blocks vs. TOR 1/4…Pulled down 11 rebounds despite not attempting a field goal or a free throw vs. MIA 2/24 to become the first rookie in NBA history to grab at least 10 boards in a game without taking a shot of any kind…Grabbed 13 rebounds at ORL 3/4…Notched his first career double-double with 11 points and a season-high 16 boards at NJN 3/17…Scored a season-high 14 points (6-of-6 FG) vs. SAC 3/21. Member of Turkish national team at 2014 FIBA World Cup, helping lead his country to a 4-3 finish and an appearance in the quarter finals…Averaged 9.9 points and a team-high 8.4 rebounds…Best game of the tournament came in a 77-73 overtime win against Finland, recording a game-high 22 points on 7-of-12 (.583) shooting from the field and a game-high eight rebounds... Grew up playing for Fenerbahçe S.K. Istanbul (2005-10) in his native Turkey … Was loaned to Kadikoy Belediyesi in the Turkish League’s second division for the majority of the 2005-06 season … Played with the silver-medal-winning Turkish National Team in the U-20 European Championships in Izmir, Turkey … Was again a member of the silver-medal-winning Turkish squad at the 2010 FIBA World Championships held in Istanbul … Missed two months of action due to a broken left clavicle in 2009-10 … In 2007-08 between Alpella and Fenerbahçe, he led the league in blocked shots (1.90) … Set a Euroleague record for blocked shots in Top-16 round play with 19 in 2007-08 and garnered Turkish League All-Star honors for the second year in a row … In 2006-07, led the league in rebounding (11.2 rpg) and ranked second in blocked shots (2.00 bpg), earning Turkish League All-Star honors and Eurobasket.com All-Turkish League Newcomer of the Year accolades. Born Omer Faruk Asik on July 4, 1986, in Bursa, Turkey…Hosted a holiday party with the USO and Chicago Housing Authority in 2010 … Visited members of the Houston Police Department on Sept. 11, 2012, thanking them for their service in commemoration of Patriot Day...Donated over 1,000 Pelicans tickets to underprivileged children during the 2014-15 season.